Many training providers now offer open-access Train the Trainer courses. But our years of experience in the health and social care sector suggests particular learning needs that can't be met with generic courses. This is why we're providing tailor-made programmes which are focussed on the specific needs of our partner agencies and based on particular subject areas. While there's much to be said for skilled, experienced trainers expert in their field delivering courses in traditional classroom-based settings, there are of course the issues of expense, convenience and logistics involved in hiring an external consultant to deliver a one or two-day course. In his article for the The Guardian's Social Care Network, JCK Training's Connor Kinsella sets out some of the problems with existing models of training in the social care field, and how we're using the latest research evidence from the sector to offer alternative models of learning. We work with partner agencies to identify and mentor key personnel who have the potential and enthusiasm for passing on their skills and experience to colleagues. Training delivered this way is more flexible, can be delivered in small sections or 'chunks' not possible where trainers are travelling long distances, and can be very precisely aimed at local needs, client groups, new policies and procedures, and national developments. Feedback and post-course development can followed up in supervision, and training can be delivered specifically to 'roll-out' new policies and procedures. All in all our Train the Trainer programme represents tangible cost-savings AND highly targetted, flexible training solutions. A traditional classroom-based course at a venue of your choice for 3 or more potential trainers. 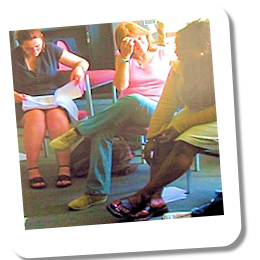 The course will include Preparation, Course Design and Presenation Skills and can be generic or focussed toward specific subject areas and orgasnisational learning needs. We can follow-up the course with further mentorship, advice and support via telephone, Skype and email. We co-facilitate an in-house course with your nominated staff and provide feedback and support with course design, preparation and presentation. However you'd like to configure your Train the Trainer package we almost certainly have a solution for you, at a cost that could save your organisation many thousands of pounds and provide flexible, tailor-made training options especially for your staff and service users. Call us on 0208 133 9458 or email us to discuss your ideas!